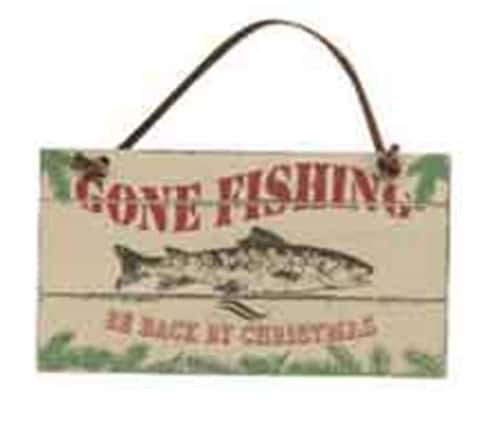 "Gone Fishing...Be Back by Christmas" Red, green & white. Picture of fish & tree. Leather strap. 5.5x3 inches. Keystone Pricing. Ho! Ho! Hold on a minute! We’re having a hard time moving around Big Sky Carver’s North Pole workshop; it’s piled sky high with Christmas gifts just itching to get under your tree. Our inspiring new ornaments can’t wait to hang around with you. We’ve got everything Christmas for everyone on your list. Happy Holidays!